What if you couldn’t jump in a Mario game? This simple question led to the Captain Toad levels in Super Mario 3D World. On its face it seems like an absurd proposition, but the Captain Toad interludes were surprisingly enjoyable breaks in one of the most relentlessly creative 3D platformers of the last decade. They served as welcome, cerebral workouts in the otherwise intense reflex-based action of 3D World, slower and more thoughtful opportunities to rest your adrenal glands and work your gray matter. But can an entire game support itself on this Mario-influenced puzzle gameplay? The answer is a resounding yes. 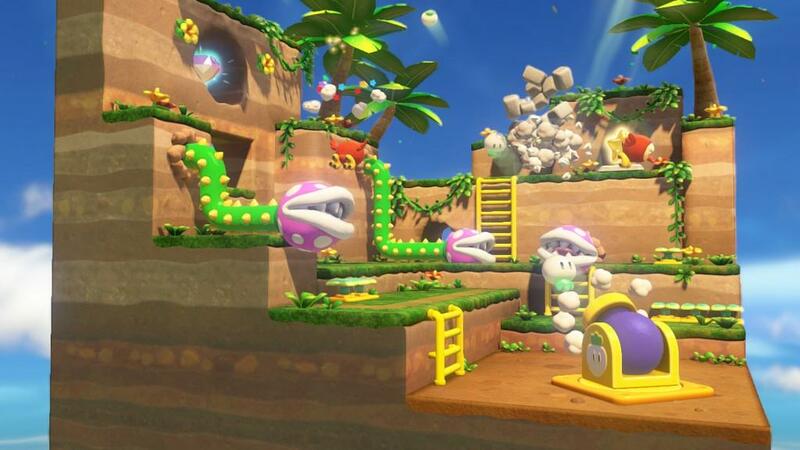 Captain Toad Treasure Tracker was one of the more pleasant and unexpected games to be announced at E3. At the time I thought it would work better on the 3DS, and to an extent I still do, but as it stands Captain Toad is a fitting coda for the Wii U’s strong 2014—a satisfyingly mild chaser to the palate-searing spice of Smash Bros. The plot isn’t nearly as grand or encompassing as the main series Mario games, though. Basically, Captain Toad and Toadette are out hunting for power stars when a giant bird claims their prize. Toadette refuses to let go of the star and is carried away with it. Toad is left scratching his head, a very small hero with a very big adventure stretching out in front of him. He’ll have to hook back up with Toadette, collecting huge sacks of coins and stars along the way. Toad was the fastest character in Mario 3D World, but as Captain Toad he’s loaded down with a heavy hiking pack. He (and later Toadette) can’t jump, at all, and his sprinting speed is only marginally faster than his normal waddling jog. This calls for a drastically different style of level design, the kind we’ve already seen in 3D World’s interlude levels, and Treasure Tracker represents a massive expansion of that idea. These levels are like small dioramas of classic Mario ideas, turned on their heads without the ability to jump. In many ways they reminded me of the LEGO Minecraft micro-world sets my brother is obsessed with. A more apt comparison might be a Rubik’s Cube. Indeed, several of the levels have spinning, shifting sections like the classic hand puzzle, areas that can be manipulated by tapping on the GamePad touch screen. Most of the levels are cube-shaped, and as in 3D World you can rotate the camera all around them. This is crucial for viewing puzzle solutions from a different angle, and it’s usually how you’ll spot the hidden stacks of coins, golden mushrooms and gems squirreled away in each stage. The gems are particularly important—they’re a lot like the green stars in 3D World, in that they unlock new chapters and in higher numbers, secret bonus stages. Not to put a cliché on it, but most puzzles in Treasure Tracker can be solved by literally looking at them from a different perspective. This new spin on the old formula can challenge the preconceptions of even the most diehard Mario player. Small blocks now must be scaled by finding ladders. Captain Toad can’t swim—with that heavy pack he sinks like a lead pipe, so he’ll be doing all his puzzle solving on the ocean floor. Good thing he appears to have borrowed Mario’s infinite lung capacity from the old platformers. Classic enemies in particular take on a daunting, dare I say frightening, new dimension in Treasure Tracker. Captain Toad can only defeat enemies by stomping them from above or hurling picked turnips, which are in limited supply. Bullet Bills must be avoided, or redirected to shatter impassable blocks. More often than not the best option is to run away. I’ll say this much, I’ve never been afraid of a humble goomba or shy guy before. Captain Toad is not a fighter like Mario, Peach or Luigi. He’s kind of a courageous coward, if that makes any sense. He clearly has a sense of duty and an intrepid lust for treasure, but on the other hand he’s terrified of everything. The way he shrieks and runs away from enemies, or cowers in the presence of ghosts is both amusing and a little bit sad—you can’t help but feel bad for him. The developers gave Toad a ton of personality through his animations and minimal voice work. Captain Toad doesn’t make it through his world by hopping, bopping and facing Bowser’s minions head-on. He’s just trying to get to that star at the end of each level and load up on coins along the way. Most of his offensive abilities feel more like lucky accidents—falling off a ledge and squashing a goomba, or inadvertently making a level collapse onto a boss simply by climbing it. This new take on classic Mario ideas makes for an incredibly addictive puzzle game. Each level only takes a few minutes to beat, but nabbing all of those hidden gems and completing the secret objectives on each level, like collecting a certain number of coins or solving an environment puzzle with a minimum of moves, can take some serious exploring. Collecting all the secrets not only gets you a higher ranking, but unlocks special challenge levels where you go for a lot of cash in a time limit, or explore harder mazes while pursued by deadly mummy clones. Even better, if you have save data from 3D World you gain access to select stages from that game, but played from the whole new perspective of Captain Toad. Don’t be surprised if you’re at this game for hours at a time; it has a “just one more level!” quality that will likely keep you up until 2AM many a night. To keep things exciting there are occasional minecart stages as well. Thankfully these aren’t nearly as frustrating as the sadistic minecart sections in Donkey Kong Tropical Freeze—they’re more like an on-rails shooter actually. Toad or Toadette can fling turnips at enemies, pow blocks and coins stacks, but those precious gems can be scored with a direct hit as well. As in the puzzle levels the gems are pretty well hidden, usually off the normal viewing angle or encased in bricks. While you can aim with the GamePad gyro I found this feature cumbersome; luckily the analog sticks work just as well, with the gyro supplementing for fine-tuning. Treasure Tracker is a beautiful game too. The tiny levels let the developers really cram in the details, like colorful vegetation, rippling waterfalls and shimmering coins. The game is presented as a series of journal entries on the main menu, evoking an intimate, storybook atmosphere, with adorable cutscenes scattered throughout the levels. The variety of environments is impressive, spanning all of the classic Mario themes and a few new ones. The typical grassland levels start you out, but soon you’ll be spelunking in dripping caverns with shimmering walls, scaling a volcano, and rearranging the sections of a tricky haunted house. I was surprised how many old Mario ideas could be repurposed as environmental puzzles, and damn good ones at that. I haven’t had this much fun with a puzzler since Chuck’s Challenge, and fans of the Pushmo games will probably find plenty to like as well. Treasure Tracker is so good, in fact, that I’m a little disappointed it isn’t a simultaneous release on 3DS like Smash Bros. Its bite-sized levels, more modest scale and emphasis on dual-screen gameplay would be perfect on Nintendo’s portable. I’d be very surprised if we don’t see Captain Toad and Toadette tracking down treasure on the handheld in the very near future—it would be a perfect launch title for the New 3DS when comes out in America sometime early next year. On Wii U however, Captain Toad Treasure Tracker is the best kind of pleasant surprise. It’s a subtle little game that came out of nowhere, but packs a ton of gameplay and value. It’s a great way to close out Wii U’s 2014, and its charming single-player puzzles are the perfect way to wind down after the competitive chaos of Smash Bros. Don’t miss this one, not even for all the coins in the Mushroom Kingdom. 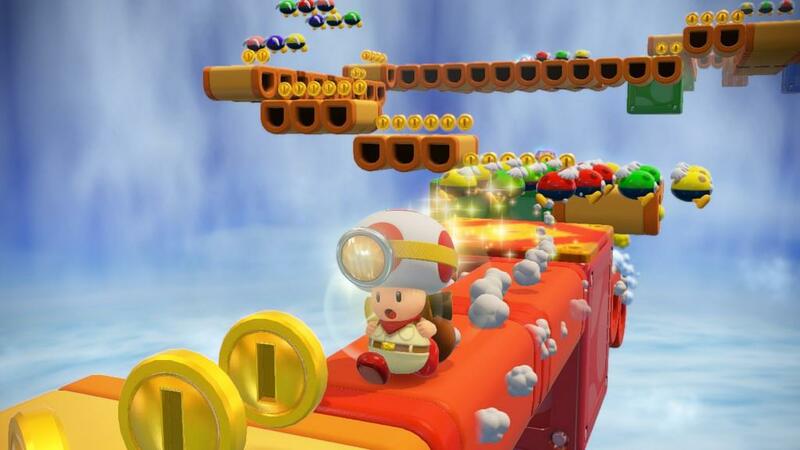 Like hidden treasure, Captain Toad Treasure Tracker packs a lot of value into an unassuming package. With a supremely addictive set of charming, brain-teasing levels, stellar production values and a budget price, Captain Toad is the perfect way for Wii U owners to wrap up 2014 after indulging in Smash Bros.